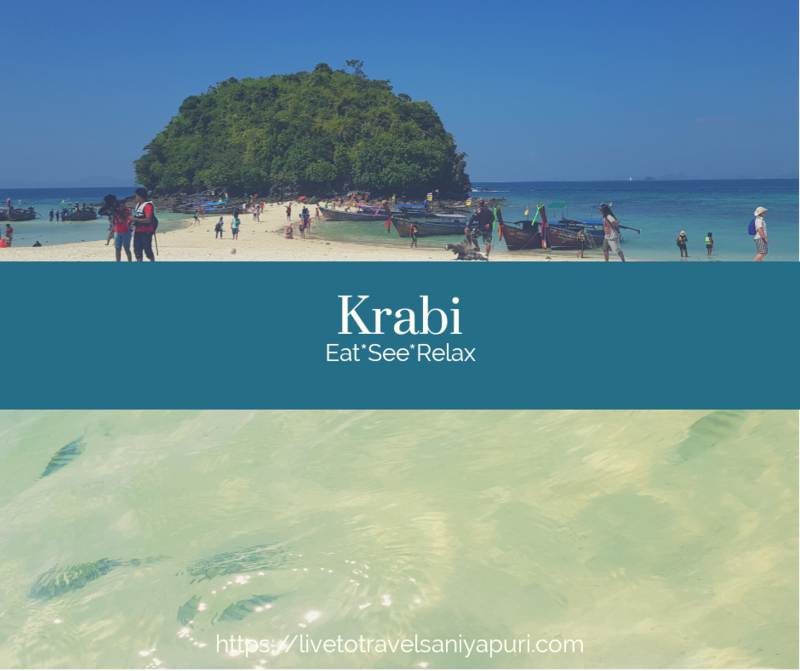 Krabi town is for those people who just want to relax, enjoy time at the beach and eat some good food. I had a wonderful time there, it is beautiful and peaceful. 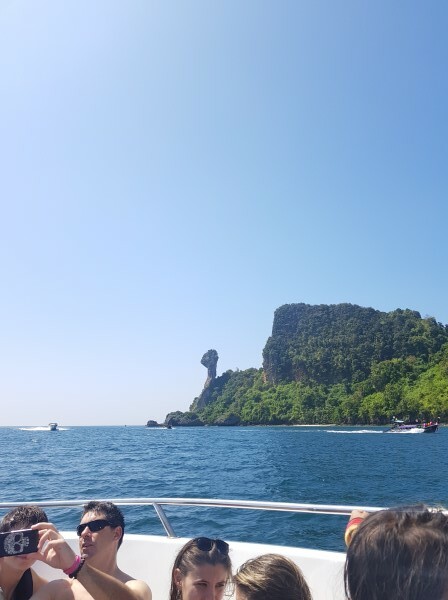 I feel 3 days are sufficient for the visit because Krabi has only 2 markets and a few attractions, rest it all depends on what you want from your trip. Prepare your documents for Thai Visa- First things first. If your country is permitted for an on-arrival visa then you will get all the details in the link given here and you can also check if your country is eligible for the on-arrival visa. 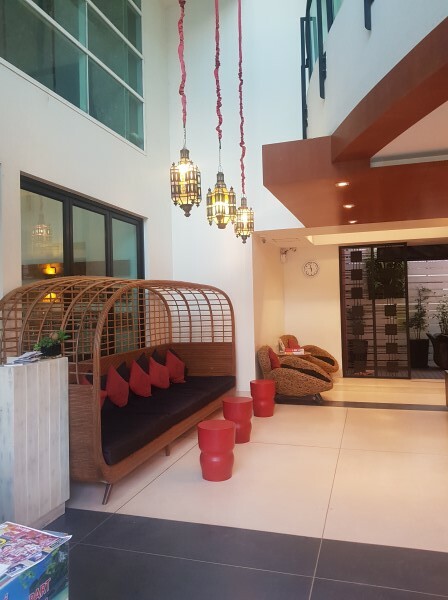 Where to stay in Krabi Town? 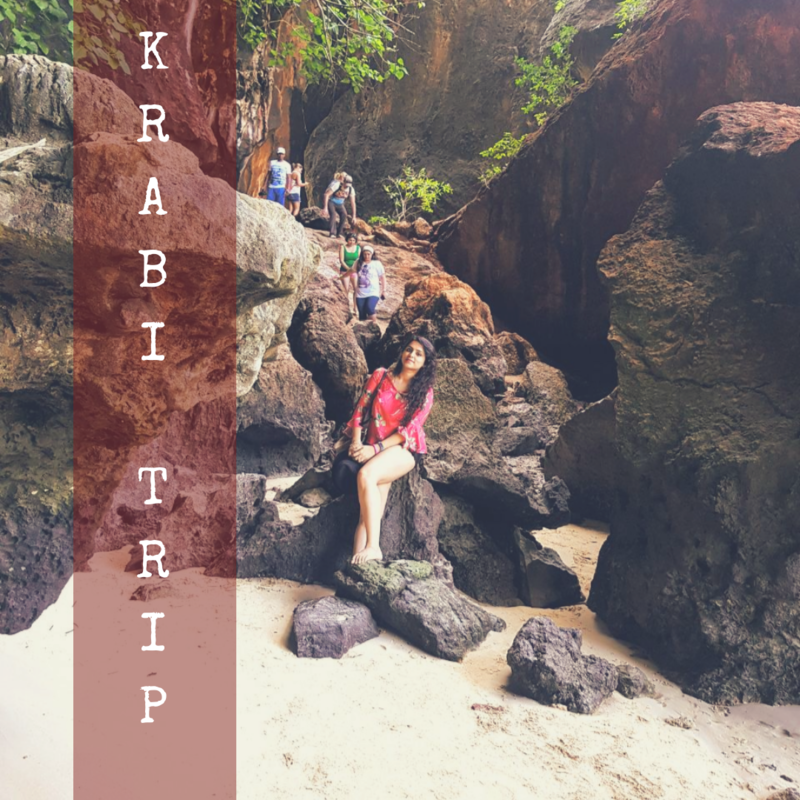 What are the things to do in Krabi, Thailand? Are there markets in Krabi? Where should you stay in Krabi? How many days to spend in Krabi? There are only two types of seasons in Krabi, Dry and Rainy. It is hot all around the year. The tourist season is the dry season, from November to April. Book your tickets early to get cheap flights and accommodation under good rates. You will get cheap flights in rainy season but then you will end up spending your time in the hotel. ++ I stayed at ‘The small‘ hotel and I found it better than advertised. Most importantly, the restaurant was great. There is only one restaurant in the hotel. They managed to fulfill all my food requirements. I had veg pasta, veg pad thai noodles, veg Thai curry and all the items were superb! The staff was very friendly, the room was pretty and spacious, so was the restroom. The hotel is on the main road near the Ao Nang beach, Ao Nang market and many restaurants. The location is really good. ++ Holiday inn resort was nearby the above hotel and seemed wonderful. Loved its ambiance. Would love to try it next time. 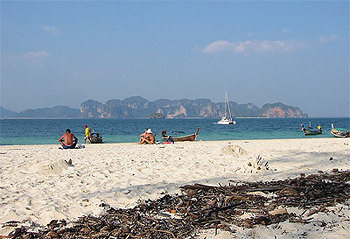 This tour will cover 4 islands, some tour guides also take tourists to Railay beach apart from the 4 islands. Transfers are made by a speedboat to 4 different beaches, all are beautiful and you get to do SNORKELING. You will get free drinks on the boat. Apart from the speedboat, there are Long tail boats that can be used but it is slow as compared to the speedboat. Every island has something different to offer. Snorkeling is possible on almost all the islands. 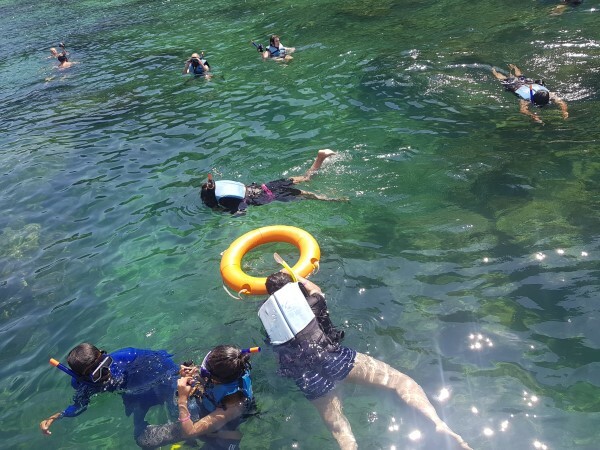 At Tup Island, you will get to practice snorkeling as the depth is not that much, then near Chicken Island you get a chance to snorkel properly and enjoy ocean life. You will also be able to see Nemo(the fish)! Exciting isn’t it. Chicken Island is named so due to the Chickenhead shaped mountain. Look at the picture again. Stop Poda Island will be your last stop where you will get your lunch. There are rocks in the water, while you walk or snorkel just stay away from it as these are really sharp. I got many cuts. This tour will be over by 4pm then you have the half day left for the market or a massage. Nature’s way of relaxing your body. It is a Hot Spring near Khao Phra Bang Khram Nature Reserve. There are stone cups filled with hot water from the waterfalls. You can sit inside the so-called Jacuzzis and let your hair down. Since the demand is so high there are also man-made tubs in addition to the natural ones. I have read that whoever takes bath in that water, gets rid of all the skin diseases. I couldn`t try it unfortunately but you definitely should..You can book your tickets here. Charges are around 900 Baht/ person if you buy the package from Krabi. There is a Crystal/Emerald Pool near the Hot Springs which is really beautiful and worth visiting. A complete day can be spent in this area as there are many such pools and waterfalls which should not be missed. This tour is already on my to-do list for my next visit to Krabi. If you love beaches then you MUST visit this place, and if you are only in Krabi because of beaches then there is a resort at this beach. 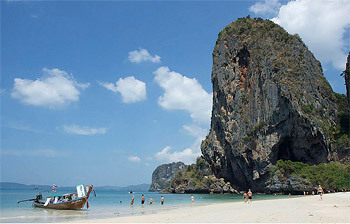 Go ahead and book it because you can`t find a better beach in Krabi. 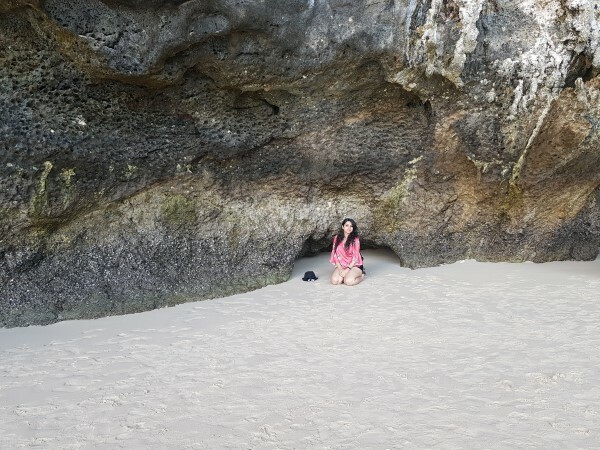 This beach has caves, rocks for rock climbing etc etc..
All these beautiful caves are at this beach, you can also enjoy rock climbing here. It is beautiful, just grab a seat infront of the Ao Nang Walking street and enjoy the view. Above was the list of Best Things to do in Krabi Town, Read the next section to read about Shopping in Krabi. 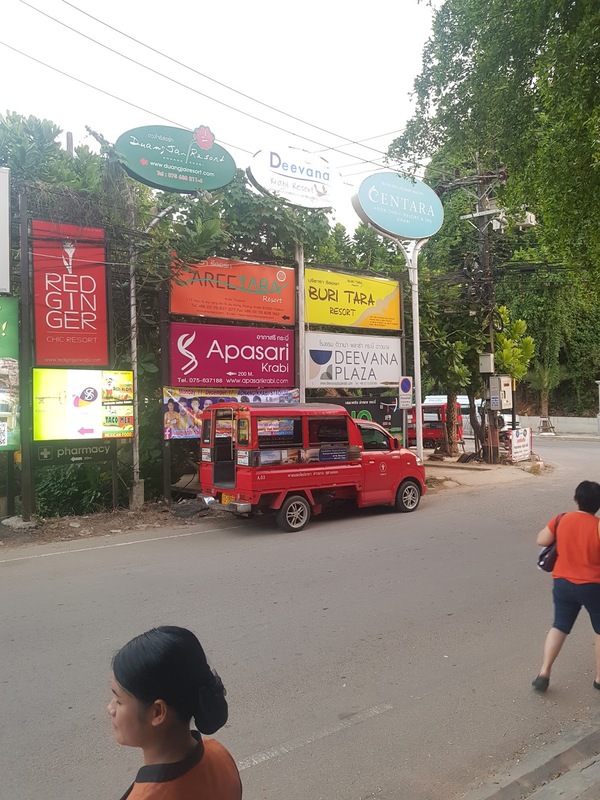 It is approx 30 mins from Ao Nang, almost every hotel gives the facility of pick up n drop to that market @ 200 baht/person. It is organized every Fri, sat n sun. The market has all kind of stalls, food, plants, souvenirs, clothes, and accessories. There are more shops n complexes nearby. Swensen’s is also there, yum! Chewy chocolate flavour is yum from Swensen`s. Even if somebody didn’t know about the market, one would get to know definitely as they advertise about the market on loudspeakers. As it is one of the major attraction of the island. 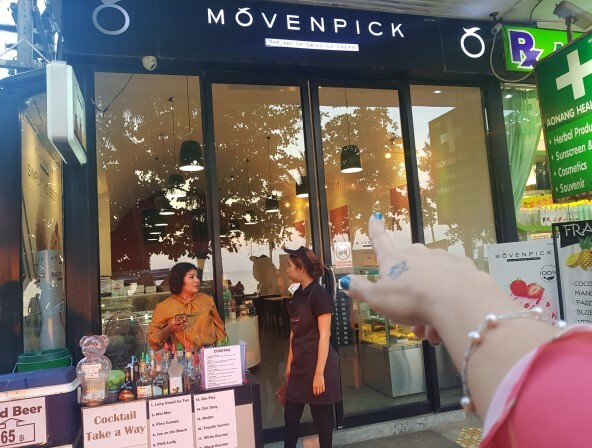 It is 10mins walking from the small hotel, has my fav ice cream parlour – moven pick, McD, Watson and a few souvenir shops. Shopping is the only thing to do in Krabi at night apart from massages and cafes. Do try the noodles or the pasta. But no worries, I can explain. 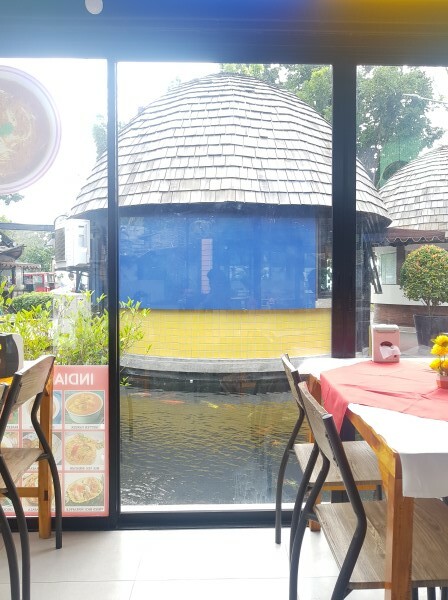 There is only one Indian restaurant near Holiday inn resort (remember resort, not express. B`coz both are there) which is in the yellow hut. The food is delicious, nearly the same taste like you will find in India. There are 2 types of tuk-tuks, one a tempo kind and second a carriage attached with a scooty and that`s one of it`s kind..I enjoyed the ride. You will be transferred by tempos to n from ferry and to other places where groups are going.Enjoy that! Krabi to Phuket is around 2 hrs by ferry and you must choose ferry it is fun. You can also opt for a car but that will be expensive. You can travel to more places from Krabi like Pattaya or Bangkok. You can also check my posts on the above-mentioned places to plan your trip in a better way. 3 – 4 days should be more than sufficient. 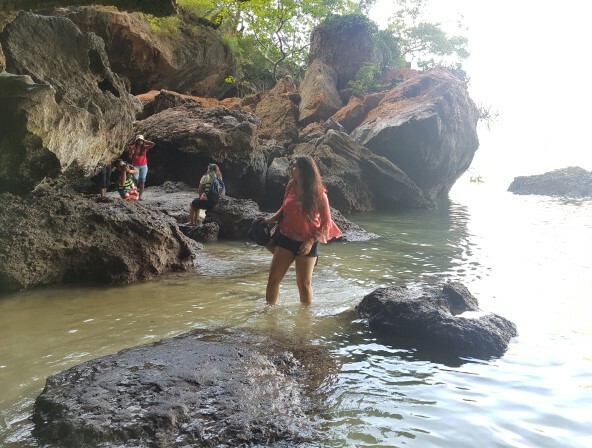 There are not many activities in Krabi. 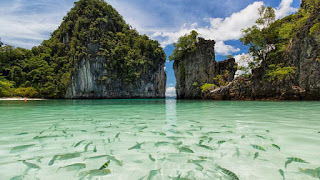 You will need more days if you plan to visit Phi-Phi island/ James Bond island or Coral island. If we only talk about Krabi then 4 days should be enough. 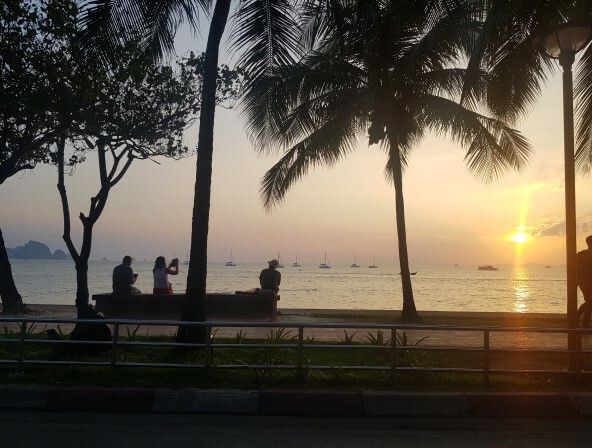 Pingback: Things to do in Pattaya – Holiday Destination Ideas! I need to go back to Thailand and visit Karbi. Looks awesome! These are some great photos. 📷 Thanks for sharing your amazing travel experience. Thanks for sharing! I went to Krabi a few years ago but just stayed at my resort (it was for my honeymoon). Now I want to go back and explore some more! Thailand has been high up on my bucket list for a long time. Now I definitely feel it should be more of a priority. Thanks! You have some beautiful images in this post! I had never heard of Karbi but it’s no definitely on my bucket list! Great post! Everything looks so pretty!! I am bookmarking and pinning this article. So much information, and Thailand is one of my bucket list travel destinations! Thank you, Anita. I am glad I could help in making your holidays better. I love how you break everything down! When we plan to go to Thailand we will keep the place in mind! Than you for sharing! Thanks, Deanna, for inspiring. I hope you have a great time.